Shark Diver : Shark Diving : Swimming With Sharks: A 99.999999% effective shark repellent! A 99.999999% effective shark repellent! Finally, after years of careful research and countless hours spent analyzing shark bite data from all over the world, after comparing all the shark repelling products on the market, we at Shark Diver have found the one shark repellent that works in give or take 99.999999% of the time. But first, a little background on our research. 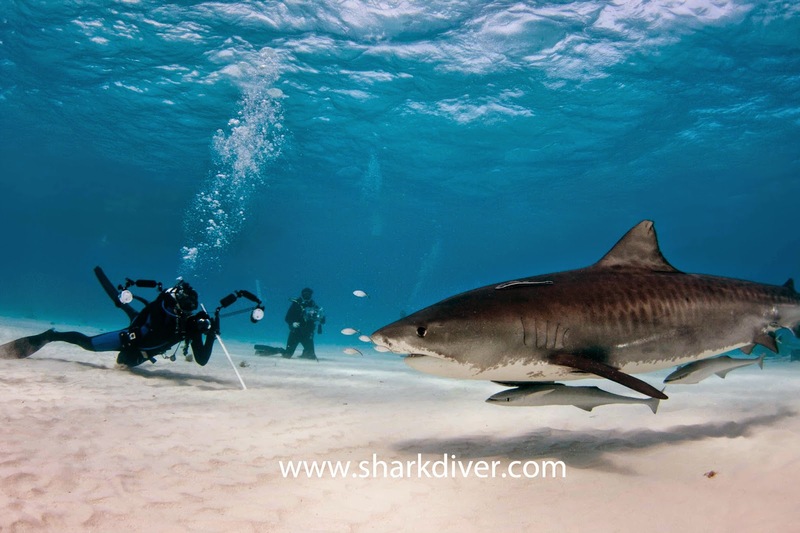 To obtain our data, we have been diving with Great White Sharks at Isla Guadalupe, Tiger Sharks in the Bahamas and Bull Sharks in Fiji. Everyone is always skeptical about the testing methods used to obtain the data. The companies advertising their products always say that you can't test the product on humans, because of the dangers involved. We are so confident in our shark repellent, that we put our own butts on the line to proof the effectiveness. More than anyone else can say. ... Oh yes, we have taken some pictures, documenting our work, for all you naysayers out there. Ooops, the shark came a little close here. 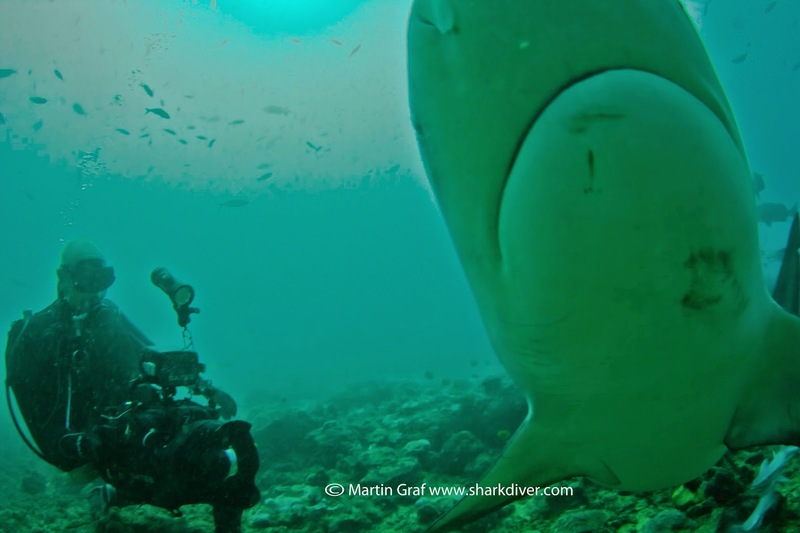 A Tiger Shark showing no interest in biting the diver. But what about the supposedly most aggressive shark, the Bull Shark? Wow, that was close, but once again, even a Bull Shark didn't bite the test subject. But how about a lot of Bull Sharks? The video shows, that the sharks came close, but again, showed no interest in biting our test subjects. So what is this incredible shark deterrent, that is so effective, that if it were a drug, it would be the most effective drug ever produced? So effective that there is not a single safety device out there, that has a better success rate? Well, it is quite simple actually. The common denominator for all the people that went into the water for thousands of years is this. The were all human! Being human gives you such a miniscule chance of getting bit or killed by a shark, that there is simply no way to design a device that will statistically lower your chances of getting bit by a shark. Think about it, what else is 99.999999% safe? So let's go out and enjoy the ocean. Just be careful on your way there and watch out for those rip currents.